We didn’t see any rattlesnakes as we were wandering through the park, but we did see a mule deer, and a mountain bluebird and a spotted towhee and a family of pigeons that lived inside one of the formations. We all laughed as we watched them crawl (wait, I don’t think pigeons crawl) out of the split in the rock – they just kept coming. I told her there was a spotted towhee in the tree and her father lifted her up so she could see it. She reacted with quiet reverence. The dad then repeated the name to her and she giggled. Later the father asked me what another bird was – a pigeon/rock dove. (I didn’t even have to ask my brother to identify that one.) I don’t think the man was from the U.S. or maybe he just hadn’t been around a lot of birds, but he was friendly and inquisitive and his daughter was cute as she hopped along next to me waiting to see what other pictures I would take. Roger got its picture jumping over the fence, but I wasn’t quick enough. A columbine – but not a good one – it’s on its way to wilting which I guess all flowers are – but this one was a few steps closer than some. Most people who visit Colorado Springs visit Garden of the Gods. Surprisingly, this is a public city park and is free to all who visit. GOTG is also a National Natural Landmark. We first headed for the visitor’s center. The center has several exhibits which we quickly walked through, a gift shop and a balcony overlooking the park. A highlight is the dinosaur picture painted on the floor/wall with a 3D perspective – although it is painted on flat surfaces. My brother pulled out his famous red chair and we got our pictures on top of the picture. Last time I was at Garden of the Gods was on a hot day in 2006. This time we went early in the morning (right when the center opened) when the weather was still fairly cool. We were early enough to get a parking lot outside the center – but already the place was filling up and getting crowded. View from the balcony of the visitor’s center. The sign by the ladies room. And the red chair makes an appearance. And Barb looks so calm. Another view from the balcony … my brother in the parking lot. 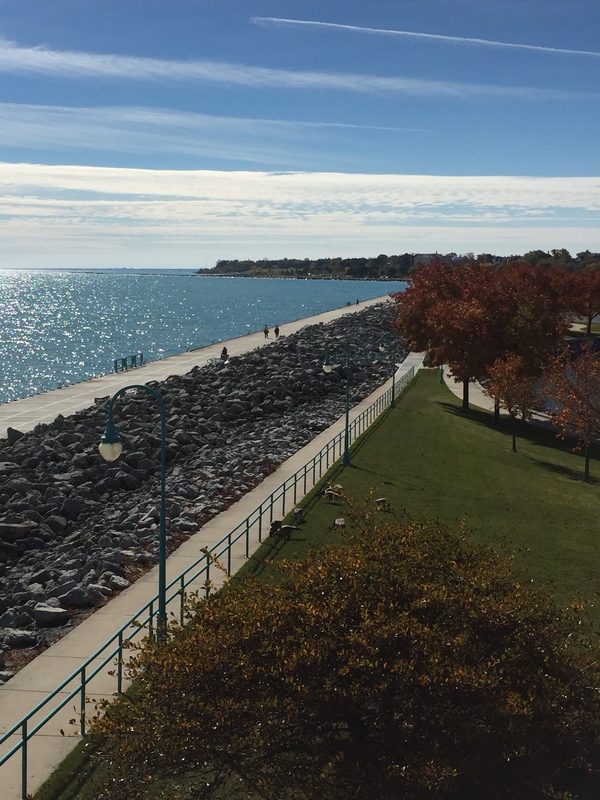 When we moved to Racine, this harbor wasn’t there. Well, at least the harbor wasn’t there looking like this – no boat docks, no buildings, no walkways, no parking lot, no trees, no restaurants … just water … and more water. 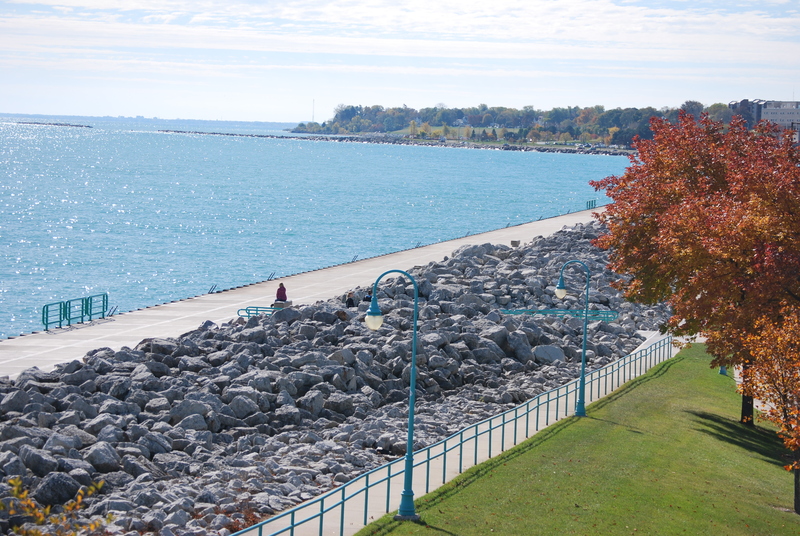 But then the city decided they wanted a harbor so they took rock out of the quarry “up Douglas Avenue” and filled in the lake until there was enough rock in the water to build on top of it. 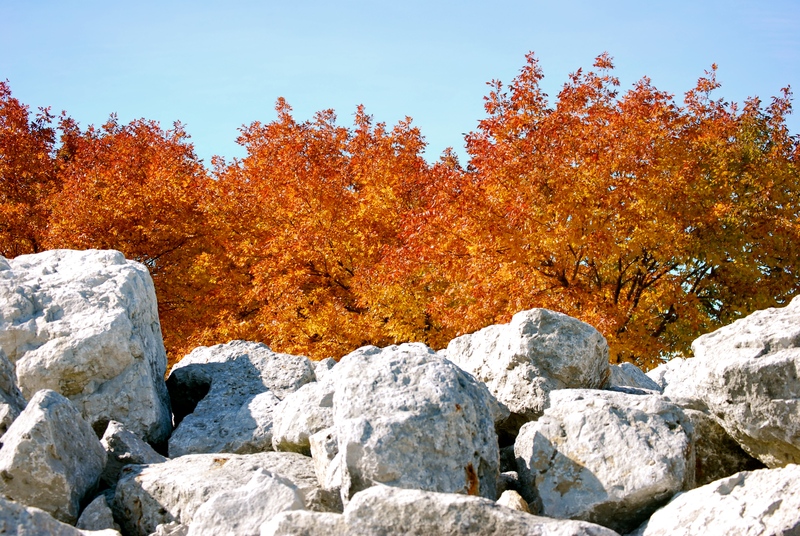 We lived near the quarry and early every morning we would hear the beep-beep of the construction machinery as they backed up and maneuvered their machines. We’d see trucks with huge tonnage of rocks heading downtown. 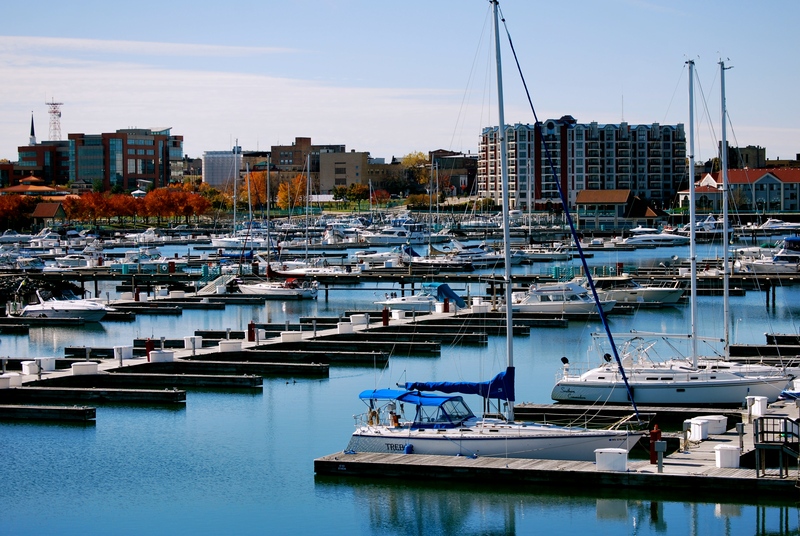 And after months of this, Racine had a harbor with a restaurant, a jogging path, walkways, trees, parking lot, boat slips/docks, fish-cleaning station and so much more. Interesting to think about what it was and what it is. “Someday we’ll have to take a road trip,” I said, kiddingly. And that was that. Because of course, I know how to get to Wisconsin and I know where to go when I get there. Off we went. Because it was rush hour, we made our way to the highway through the Northern Illinois horse farms – 25 mile speed limit, but beautiful, beautiful country … and horses. 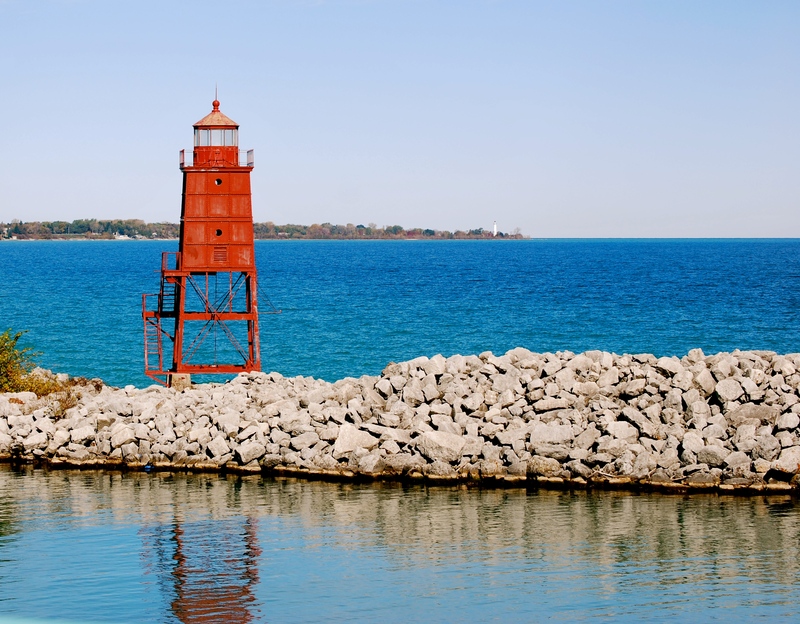 When we reached Racine, I headed right to the lighthouse. We didn’t have a lot of time and I wanted to make the best of it. When I left the house in the morning, I felt drops of rain – but now the sky was brilliant blue and the sun was glistening on the water. 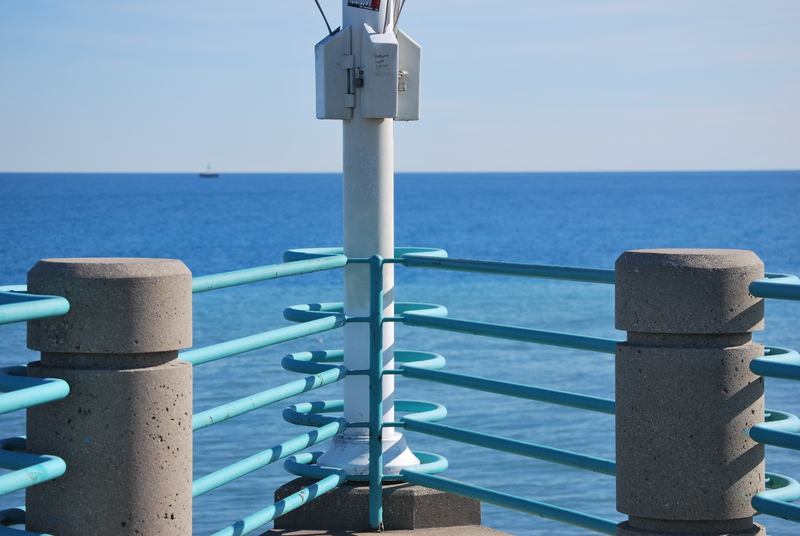 Taking pictures of the lighthouse is always fun, but I’m guessing I have about 100 of them already with an assortment of family and friends standing in front of it, (We used to live close enough to bike to it.) but I can never resist taking more. But oh, what a beautiful day and what fun to take pictures.